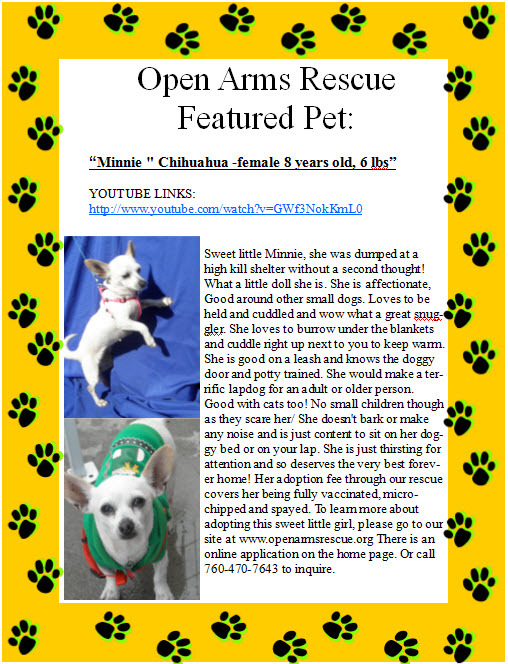 Minnie is this week "Featured Pet" of "Open Arms Rescue" based here in Imperial Beach. Minnie is in need of a new home! Open Arms Rescue focuses on smaller breed dogs. We are a Non-Profit 501c3 Registered Charity and ALL volunteer based organization. We are based in Imperial Beach, CA but we have volunteers who foster dogs for us all across San Diego County. We are always looking for more volunteers to help foster a small breed dog. We rescue dogs from shelters across Southern California and all the way into the Mexico -Tijuana Perrera (Dog Pound) and from the streets of Mexico down to Ensenada.